A couple weeks ago a made a Plus Quilt to use up some of my Fat Quarter Bundles. I wanted to give you more information on how I made it. 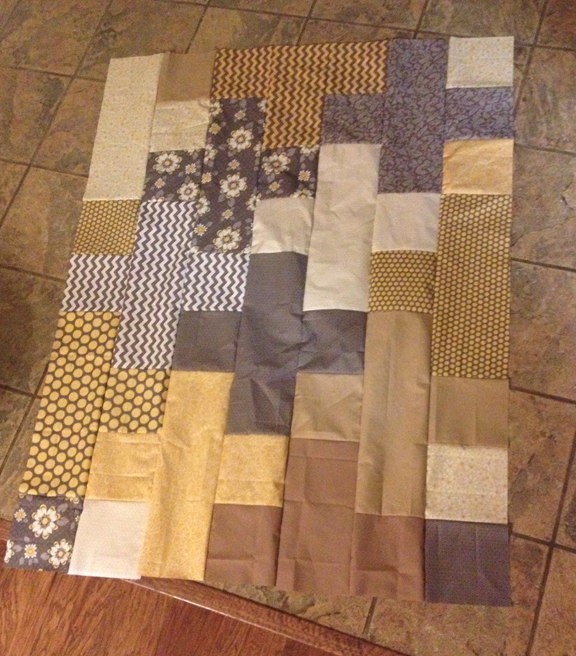 ?It takes 12 Fat Quarters and comes out to be about 45″ x 58″. Updated to add: You will need 2 2/3 yard of fabric for the backing. For extra speed in making this quilt, I cut my fat quarters in three stacks, layering 5 fat quarters at a time to cut the diagram on the left. Make sure you use a 1/4″ seam allowance. It occurred to me that if I made the worksheet in to a PDF and added some cutting instructions, I could give you a whole little pattern. Click either of these “worksheets” to download your own printable PDF. Pin your fabric scraps in the colored Plus shapes, and use it as a map to construct the 7 rows. When cutting your fat quarters, cut at least 8 extra 7″ x 7″ squares to be used in those white boxes in the diagram/worksheet. You will need 8 total “extra” squares. Extra being, squares that aren’t planned to match up with any other Plus shapes. They are strays. The fat quarter cutting diagrams each have an extra square planned. You can always mix any leftovers into the backing. To join the rows: Pin the plus intersections where applicable first. This may cause the rows to stagger at the top and bottom. THAT IS OK. Once all the rows are joined simply trim the top and bottom even. Stitch using a 1/4″ seam allowance. Grab a Seamingly Accurate Seam Guide to make sure your 1/4″ seam is always accurate. Each column has a different number of seams, so if your seam is off 1/4″ it will be noticeable when the rows are joined. Notice, in the fat quarter cutting diagrams, that the binding is also cut from the fat quarters. The first Plus Quilt I made, made up in about 2 hours. The second one made up in an hour. Well, that isn’t entirely true. I started pressing the fat quarters at 9p and finished the top (without pressing) by 10:05p. I’d say that is a start-to-finish was an hour. …probably should have pressed…. Updated to add: This Plus Quilt is not suitable for directional fabrics. The fabric bundles are by Adorn It! I picked them up last October. I hope the worksheet makes sense to you and you are able to use it for your own super quick Plus Baby Quilt. Thank you for the pattern!! I actually cut one out this weekend and am putting it together right now. I made it with 24 fqs and it’s a nice twin size. I so enjoy following you! You inspire in many ways! Thanks again!! Just completed this top. Yes, it is truly easy and fast. I did discover, however, that the 19.5” pieces should be cut 20” in order to have each vertical row 58.5”. Thanks for the free pattern. Great charity quilt. First time visitor here, but not last! I saw this pattern on another site and sought it out, so I was thrilled to find your site. Your pictures and instructions are wonderful. I am planning to use this for my next PROJECT LINUS quilt! Thank you for the pattern!! Well, back to the sewing room!! You gave no instruction for the scrappy binding. 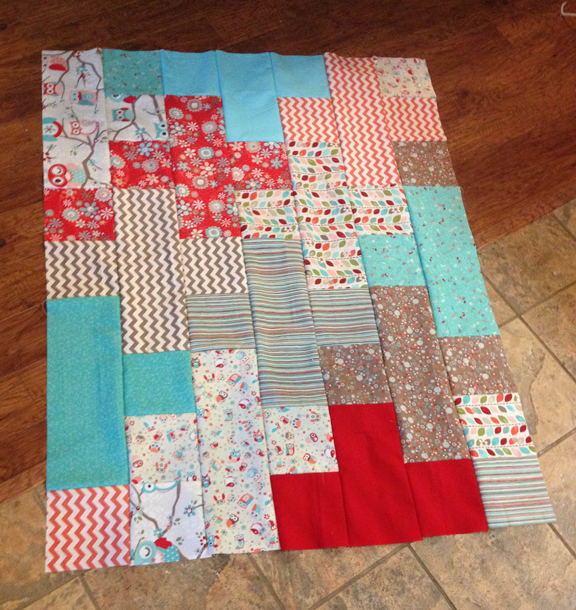 Do you sew all the pieces together into one long piece then sew it to the quilt? Otherwise, I love this pattern. I am making a baby quilt. Also I found out that not all fat quarters are measured accurately. 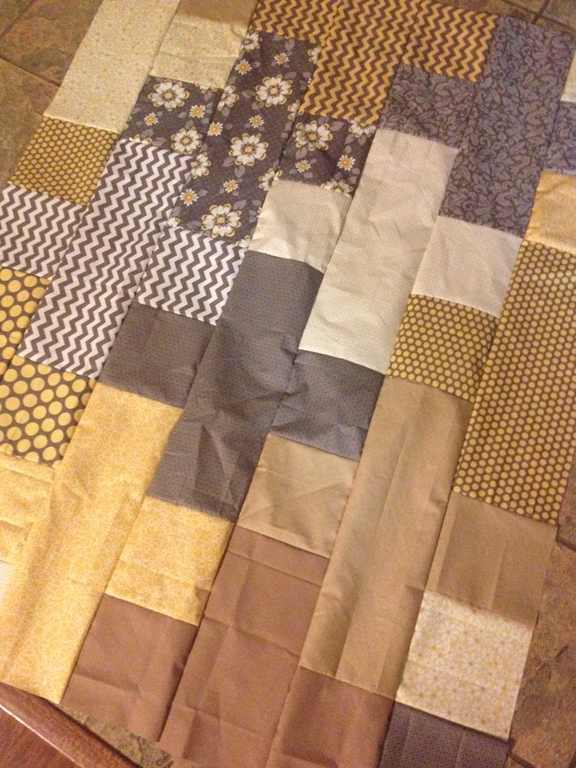 Yes, you’d sew each of the 2-1/4″ strips together to create the scrappy binding. I use it all the time.